Pink Pork is Safe to Eat! Research performed by the National Pork Board has found that most at-home chefs have a tendency to overcook common cuts of pork, for fear of serving unsafe, undercooked pork. This overcooking results in tough, dry cuts of meat that will need to be doused with sauce to compensate for their lack of moisture. These new pork temperature guidelines will help alleviate some of the stigma associated with perceived undercooked pork and help people enjoy this “other white meat” at its most flavorful, juicy—and safe—temperature. 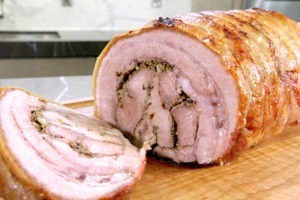 The revised recommendation applies to pork whole-muscle cuts, such as loin, chops, and roasts. However, ground pork, like all ground meats, should be cooked to 160°F (71°C). Regardless of cut or cooking method, both the USDA and National Pork Board recommend using a digital cooking thermometer to ensure an accurate final temperature. This is great news for home cooks who can now feel confident in preparing their chops, loins, and roasts to a perfect medium. And you can bet that pork cooked to the USDA recommended temperature of 145°F (63°C) will be juicy, tender and perfectly pink.